Highway and bridge contractors added 11,300 more workers to their payroll in July 2014 compared to July 2013, an increase of 3.4 percent, according to the latest data from the U.S. Bureau of Labor Statistics. Those workers are also taking home more money – average weekly earnings for highway, street and bridge contractors increased from July 2013 levels by 6.2 percent to $1,183.43, or $25.45 per hour. 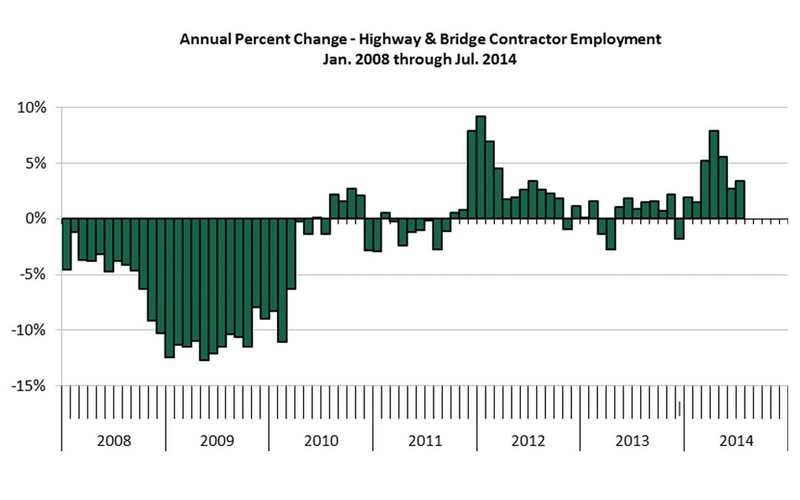 The increase in employment is consistent with an uptick in highway and bridge construction activity since late 2013. As contractors have started to do more work, they have hired more employees to work both on the job site and in the office. Despite recent employment gains, the overall number of jobs in the industry is still well below 2008 levels, when the recession began. It is unclear if the recent increases are the beginning of a market turnaround. The real value of highway and bridge contract awards, a leading indicator of future market activity, is down in 2014 compared to last year. There is also concern about the reauthorization of the federal aid highway program, which provides an average of 52 percent of state capital outlays. These factors will influence the amount of highway and bridge work across the country, which will impact future employment.